Our Golden Lab, Maggie was born with hip dysplasia and as a result of that she has developed arthritis in her joints. Although surgery wasn't an option for her, we have maintained her condition by keeping her weight on the lower side and making sure she gets regular exercise without over doing it. Having just turned seven years old a few months ago we have noticed that she is moving a little slower, whether she's getting up after a nap or climbing the stairs - she definitely does so at a slower pace. 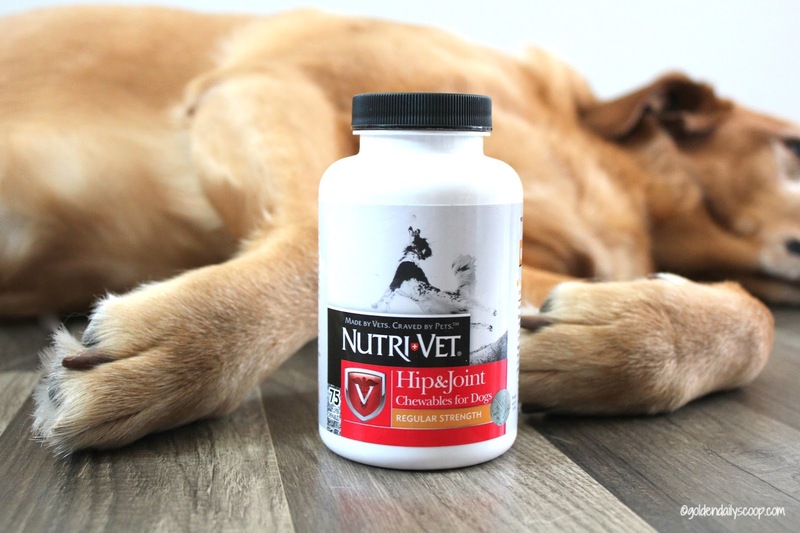 Last month we were given the chance to try out a hip and joint supplement for Maggie and we thought this would be a great time to offer her a natural supplement and see if we notice a change. This post is sponsored by Nutri-Vet® and the BlogPaws® Pet Influencer Network™. I am being compensated to help share Nutri-Vet products but we only share information we feel is relevant to our readers. Nutri-Vet is not responsible for the content of this article. Nutri-Vet® offers a wide variety of unique, veterinarian formulated animal supplements and complementary external products that promote health and well-being in dogs and cats. They ensure that every product meets company established specifications and each component or ingredient can be ultimately traced backed to it's source. For the past 30 days, we have been giving Maggie the Nutri-Vet Hip & Joint Chewable Tablets. We give her one with her morning meal and one with her dinner meal. She loves the liver flavor chewables so much that she thinks they are a treat just for her and will even do tricks for one. I love how easy they are to give her, no pills to try and stick down her throat or hide in a treat. Sophisticated formulas combined with innovative delivery systems and high palatability profiles have positioned Nutri-Vet as the leading provider of natural animal products in North America. 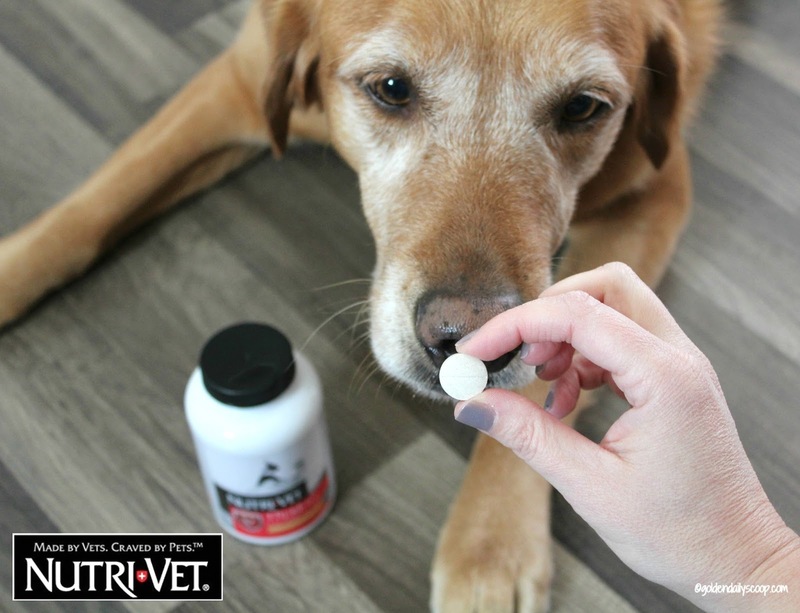 These chewable tablets are regular strength which provide 500mg of glucosamine, 100mg chondroitin and vitamin C and 10mg MSM to help maintain healthy canine joint function and connective tissue. Glucosamine HCL is the key building block for making cartilage. Recent reports in veterinary journals have validated the benefits of glucosamine in maintaining joint health and supporting mobility and activity in dogs of all ages. Chondroitin Sulfate protects existing cartilage and slows its break down. Vitamin C (ascorbic acid) is important for the formation of bone and cartilage. Manganese, Copper and Zinc are essential in biochemical reactions that help form cartilage. Just in the past week I have noticed Maggie going up the stairs more freely, usually she would pause half way up before reaching the top. She loves following me downstairs to do laundry and such so this is a huge plus! 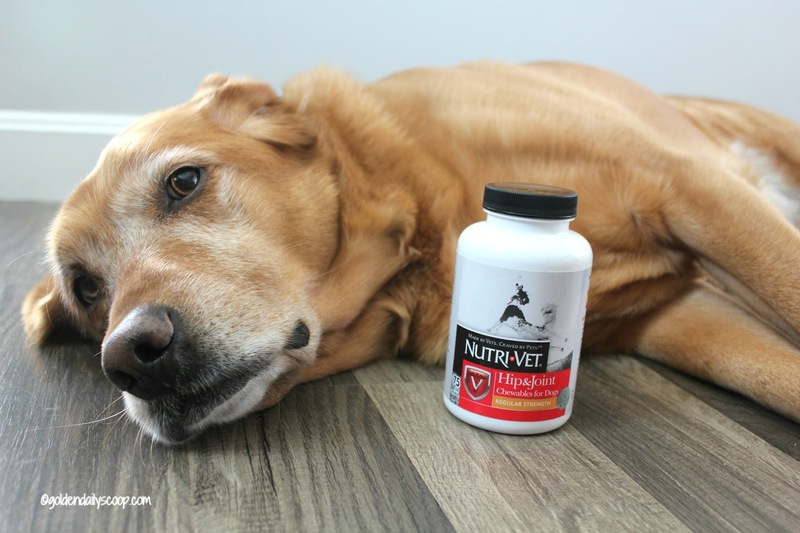 I believe in treating ailments and maintaining my dog's health as naturally as possible and I'm so happy I can do that with Nutri-Vet, my only regret is that I didn't start her on this supplement when she was younger. Nutri-Vet offers a full line of supplements and topical products for dogs and cats with an unconditional 100% Money Back Guarantee. They offer both natural and holistic products that are made with the highest standards of quality and consistency and validated by independent testing. Sign up for the Nutri-Vet Newsletter to receive exclusive offers, coupons and sales alerts. Join their Facebook Page for supplement information, giveaways and a fun community that loves dogs and cats. 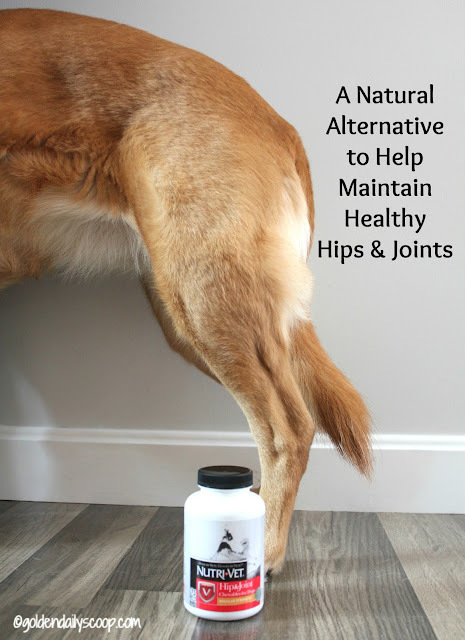 Enter The Giveaway Below for a Chance to Win a Bottle of Regular Strength Hip & Joint Chewables! This is a sponsored conversation written by me on behalf of Nutri-Vet. The opinions and text are all mine. I'm so glad this supplement worked for Maggie. Lexy is goingon nine, but so far she's a healthy girl. Aw, there is nothing like finding relief for your aging pup! I have a black lab, Django, who reminds me a lot of your Maggie. I'm very glad to hear that the Nutri-Vet has helped her and I will keep it in mind. I really like the natural ingredients. Django is 6 but my Hayley is 13. Thanks! I really wish I had found this sooner, it has been such a blessing to see her going up and down the stairs so well. Thanks for stopping by! My old girl Shunta is 14 years old and has a tough time getting around. I give her Cosaquin. I would like to try these. I would certainly recommend giving Nutri-Vet a try, they have a great selection of products for both dogs and cats. We have had two dogs with hip dysplasia and it is dreadful. I'd love to try these for Bentley. He is fine but it is a good idea to add a supplement now that he is 9 years old. I agree, it's a heart breaking diagnosis for sure. You are right, Bentley is at a great age to start him on a supplement. Great news how much these supplements have helped Maggie in such a short period of time. It breaks my heart when I meet people whose dogs are in pain from joint issues, yet they shrug it off as a natural part of aging. I always advocate for natural treatments when possible, so it's good to know this product is so effective. Thanks for sharing. Thank you! I'm thrilled to give her a natural supplement that is really help her get around much easier. We'd love to win it to start the youngest, Kronos on it, because he's an active runner and high flyer and it'd be good to start him on joint protection. It's awesome how the supplement is helping Maggie. Mr. N is fine but I wonder if I should be putting him on some protection. He likes to jump off things. I have already started by other two Goldens on this supplement. I think being proactive is the best way to go when it comes to our pets hips and joints so Mr. N would certainly benefit. i currently give my girls msm, chondroitin, etc. my oldest really needs it very badly. she has a very bad back and wobbly on the hind legs. I would like to start giving my 11 year old something for his joints. I can tell he is getting slower with age. How adorable that she thinks her supplements are treats! I love that they are chewable as I don't like giving big pills. I'm glad they are working so well for Maggie! I didn't realize dogs could be born w/ hip dysplasia, I always thought it occurred later. My Husky Icy is getting older, she's 7 now and I worry about her joints & hips. She isn't quite as springy as she used to be. I got some of Nutri Vets treats for her because I love all the healthy ingredients in them. She loves them! I'm glad you're looking out for Maggie with supplements that have natural ingredients to help her hips & joints. I love that second photo of her with her little tongue hanging out! So cute. Thank you, Cathy. Yes, we noticed when she was just a few months old that something wasn't right with her hips, very sad. So happy to have found something natural that can help her, we are going to get some of the treats, too! I am so happy they working for her, sounds like a great supplement and what I really like is that it is flavored and as you said no hiding it in treat which is such a headache. Yes, it makes it so much easier!! Do you know if they have MUCH smaller doses for the under 5 pound gang? Looking ahead I am often frustrated by the lack of "sizing" in dog supplements. Wow under 5lbs. I can understand your frustration, most supplements start at around 35-40 lbs. It normally takes time for nutritional support to show results. I'm impressed that you're seeing improvement already. Yes, she has been on the supplement for a little over a month - we are very happy with the results. I'm so glad to hear that this has helped your pup. Bean is also seven and we've been searching for a product like this to help her with mobility and avoiding feeling "stiff," or uncomfortable. I'd love a chance to try the product as we continue to research options. I have five dogs, all whom are seniors. I have tried several joint supplements and would like to see if these show any difference in them. Thanks! I know these supplements help. I have one made in NZ for our cats and while I was unsure before I began the supplement the difference it makes is immense - I urge dog lovers to give this a try. That's great to hear! I have been so happy with the results we are seeing in Maggie! Being proactive with joint care is so important. Not to mention when you have a breed that is prone to Dysplasia & Arthritis. Glad it's helping. I am sure Kilo would enjoy those and think they were treats too. He is only 4 but I do give him products with those ingredients for prevention. I have horrendous arthritis my self, especially in my knees. My Dr just finally confirmed some new blind studies show positive results for these so no longer just anecdotal. Glad it is working for you and I'll look out for it. I have also heard turmeric may be good for inflammation but have not seen medical test results. Natural supplements do such amazing things for pets! I'm glad to hear that Maggie is already seeing great results. It must feel nice that she is keeping up with the family. :) Aging can be such a pain! That is wonderful that you've already seen a difference! Hooray for tasty supplements, they are so much easier to give when it feels like a treat. I'm glad you have seen improvements with Maggie! :) I'd love to try these on my 4 senior dogs. Awesome! I'll have to look into these - I hope they make them for cats too. One of my cats has luxating patellas in her back legs, so arthritis is something she will deal with for the rest of her life (and she is only 5 now). I think something like this would really help her! 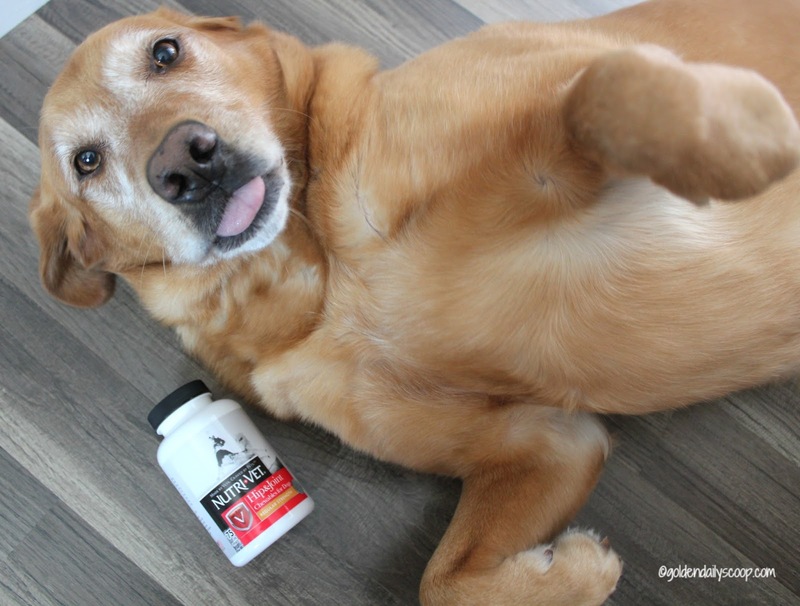 How wonderful that this supplement is helping Maggie move easier. That's great it is helping her feel better. I tried the multi vitamins and they seem to have put a bit more pep in my furry paw steps too. Great products. I have a senior rescue dog (Monty) who is my darling. We were told he's 15 years old plus. He's very grizzled around his snout. I give him some kind of Glucosamine every day and other great foods and he is doing fine. I am always on the look-out for better Glucosamine products. I would love to win these for my dog that has a problem with her hip. I would like to win this for my dog because she's getting older and often has sore joints, she moves slower now and I just want to see her comfortable and not in.pain.